BROWARD COUNTY, FL -- The largest containerized cargo ship in the history ofBroward County&apos;s Port Everglades arrived yesterday and is in port today. 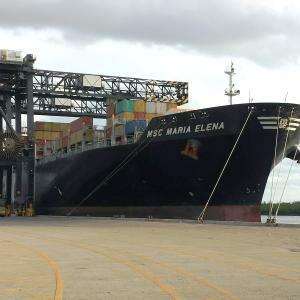 Mediterranean Shipping Company&apos;s MSC Maria Elena is 107,849 gross tons, over 1,104-feet long and has a capacity for 9,178 TEUs (20-foot equivalent units, which is the industry&apos;s standard measurement for container volumes). This Post-Panamax cargo ship is larger than a Nimitz-class aircraft carrier. At the crossroads of north-south and east-west trade, Broward County&apos;s Port Everglades is Florida&apos;s leading container port, handling more than one million TEUs and serving as a gateway to Latin America, the Caribbean, Europe and Asia. Located within the cities of Fort Lauderdale, Hollywood, and Dania Beach, Florida, Port Everglades is in the heart of one of the world&apos;s largest consumer regions, including a constant flow of visitors and up to a combined 110 million residents and seasonal visitors within a 500-mile radius. Port Everglades has direct access to the interstate highway system and the recently opened 43-acre Florida East Coast Railway (FECR) intermodal hub, and is closer to the Atlantic Shipping Lanes than any other Southeastern U.S. port. Ongoing capital improvements and expansion will ensure that Port Everglades can continue to handle future growth in container traffic. A world-class cargo handling facility, Port Everglades serves as an ideal point of entry and departure for products shipped around the world.